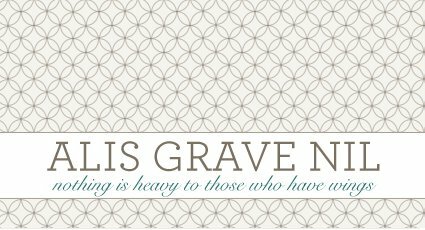 This is what I am bringing to Easter--both days, Easter Saturday with E's fam and Easter Sunday with mine. Please note that this is not Gluten-free (for GF-E), but he wouldn't eat something with asparagus and a cheese called Gruyere anyway. Please. To be fair, like all good things I know how to cook, I stole this from someone in my family. So let's call this Auntie Anne's Asparagus Gruyere Tart. 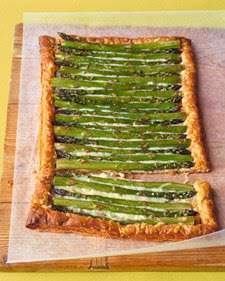 Or how about Auntie Anne's Asparagus Gruyere Rockin' Tart. Has more zip to it. Speaking of Auntie Anne, she makes a mean "moonshine"--well, not really a moonshine, but a holiday cranberry-orange champagne cocktail that I will post here at a later date. Talk about zip. Did I already post this on my old blog? I can't remember, and since I deleted that blog already I'm going to act like I just dreamed this up now. The picture and the recipe I have adapted slightly can be found here, at Martha Stewart's Everyday Food. I love this cookbook, and the magazine is filled with lots of simple recipes featuring fresh, seasonal ingredients. Preheat oven to 400 degrees. On a floured surface, roll the puff pastry into a rectangle. Trim uneven edges. Place puff pastry on a baking sheet. With a sharp knife, lightly score pastry dough 1 inch from the edges to make a rectangle. Using a fork, pierce dough inside the markings at 1/2 inch intervals. Remove pastry from oven, sprinkle with Gruyere. Trim the asparagus to fit crosswise inside tart shell. (If they are thick, sometimes I cut them in half lengthwise so they will cook through.) Arrange in a single layer over Gruyere, alternating ends and tips. Brush with oil, and season with salt and pepper. Bake until spears are tender, 20-25 minutes. Gruyere smells really strong when you grate it. If you're not used to strong cheese, be prepared for your family to tell you it smells like feet. That was gross, huh? Well, I tell it like it is. But rest assured that when you bake it, it turns into something magical and yummy. Do not give up. It's also really hard to slice once it's finished. I usually cut it into 2 or 3 inch squares. I've found the asparagus harder to cut through than the pastry. Usually I press down with a sharp knife first, then go back with a pizza cutter to make sure it cuts through. Good luck. People will act like you invented sliced bread when you show up with this thing. Accept their praise and love. You deserve it. Let them eat asparagus, I say. I bought stuff to make two of these--one for each day--and also to use the same basic recipe to try something new. For the other one, I bought extra sharp cheddar, almonds, and Granny Smith (tart) apples. We shall see. If that one is gross I will throw it out and never mention it to anyone. MMmmm sounds and looks yummy! You've given me great idears! P.S. Happy Easter to you and your's! Asparagus has no place in a tart. You monster. That looks and sounds delish! So where can I find you on Sunday? ?